Sequel to Buchanan's fantasy debut, Farlander (2011), which featured an evil, expansionist religious empire, its democratic adversaries and a saintly assassin cult. Having destroyed the Roshun assassins, the Holy Empire of Mann turns its full attention to the siege of the city of Bar-Khos. The young Matriarch, Sasheen, leads Mann's vast armies in person, while tough, brilliant general Marsalas Creed struggles to gather reinforcements for the dwindling garrison, which Bar-Khos' allies are reluctant to send. Old assassin Ash, meanwhile, wracked with guilt over the callous execution of his innocent apprentice, Nico, by the Matriarch, determines to kill Sasheen or perish in the attempt. 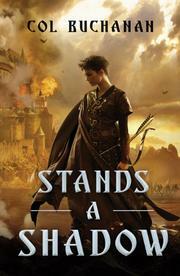 What follows—Ash's adventures interspersed with bloody battles—is well rendered and nicely paced but rarely surprising. Except when one day a lake is frozen hard enough for a fleeing army to cross, whereas a day later one of the characters is swimming in a nearby river and not even complaining of the cold. The question that lingered after the first installment, whether or not Buchanan has a genuine imagination, must be answered in the negative: A few steampunk overtones, like flying warships, add little to the standard mix, no matter how competently crafted. Readers willing to settle for stirring combat and vivid details may hang around, but those wanting a bigger bang for their buck will not.